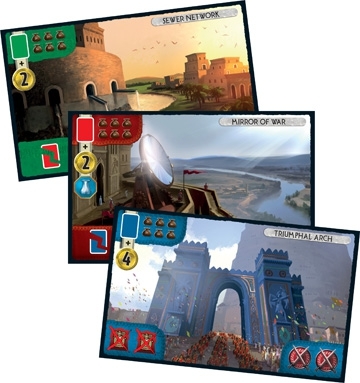 Game contains two expansions – play them separately or together. Babel is a worthy expansion for an already-fantastic game! Babel adds two new gameplay elements to 7 Wonders. Tower of Babel and Great Projects. You can play one or both of these with your original game, and they both have global effects. Tower of Babel allows you a new option in normal gameplay: to discard a card to “build a Babel Tile” (thus forfeiting the 3 coins you would normally receive for discarding). Everyone has three Babel Tiles they can potentially play throughout the game (distributed at the start by the usual “take one, pass the rest” method). You receive bonus Victory points at game-end for playing these tiles (playing all three tiles gives you an extra 10 Victory points). Building a Babel Tile effectively changes the rules of the game for everyone. The effects can be both good and bad (for example, some impose taxes or rewards when playing certain colour cards, some give universal resources, some change the price of commerce when buying resources from others). There can be four visible tiles/rules at any one time, and the fifth tile built will actually cover up the first, eliminating that rule. As a result, you may find players are racing to play more tiles, to speed up the abolition of a particularly nasty rule. Great Projects introduces Great Project Cards which are basically structures (one per Age) that players can choose to participate in building, to get an associated benefit/reward. These Project Cards greatly resemble the cards in your hand. They come in the major card colours and have the Age I, II or III graphic on the back. You can also see some examples or the Great Project Cards pictured above. When each Great Project Card comes into play, a number of “Participating Tokens” will be placed on it. To participate in building the structure, you must first be playing, in normal play, a card of the matching colour. Then you announce you are participating in building the Great Project, and pay an additional cost (coins and/or resources as displayed on each project card). You can then collect one of the Participation Tokens from the Project card. At the end of the Age, if all Participation Tokens are gone from the card, the Project was successfully completed, and all participating players receive the reward on the card. If there are still unclaimed Participation Tokens, the Project was not completed, and nobody receives the reward. Additionally, those who did not participate in the failed Project receive a potentially hefty penalty. The same player can participate multiple times to prevent the Project’s failure, or to receive the reward more than once. This expansion ties in really well with the existing 7 Wonders game and expansions. The feel is consistent and Babel adds meaningful depth to the game. Despite the number of different elements, Babel doesn’t feel clunky, or make playtime too much longer. The pieces and cards are all of the same high quality to those in the other expansions, so fans will not be disappointed! Best: Gameplay is exciting and the pieces are beautiful. It’s easy to learn; we found it seamless to add these additional elements with experienced 7 Wonders players. The rewards and penalties in both parts of this expansion are worthwhile and cause players to make use of these new elements. Worst: It can be difficult to keep track of the new rules on the Babel Tower sometimes, and with so much going on, it’s more difficult to keep an eye on what other players are doing. I also wouldn’t use these expansions if showing someone 7 Wonders for the first time. As a 7 Wonders fan, I’m speaking from a position of some bias, but I am thrilled with this expansion so far! There are enough tiles and cards included in the box to ensure a different game each time, and I am sure we will be always including Babel expansions in our 7 Wonders games from now on! The cool thing about 7 Wonders expansions is that they simply build upon the structure of the original game. With Babel a new element of strategic thinking is introduced and takes the game to another level. It takes a little bit of time to understand the new components, but once you understand the additional rules, the game remains very simple and follows the normal pattern of 7 Wonders game play. I would recommend the game to anyone who has played 7 Wonders a fair amount and wants a new challenge. It might be difficult for a beginner of 7 Wonders to keep track of the game play and rules + the expansion, but experienced players should have little difficulty grasping the new concepts. 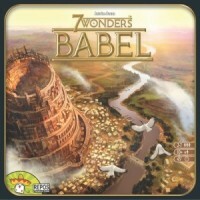 Add a Review for "7 Wonders: Babel"